There’s something special about the relationship you have with your senior horse. That partnership that’s endured years, tears, ups and downs. You probably know your horse better than you know your best friend. While he may seem like the same old horse, his needs are changing as he ages. Even if he’s weathered previous winters without any trouble, take the time to make sure he’s getting the care and support he needs and deserves. We all know the saying “you’re only as old as you feel.” Turns out it’s as true for our horses as it is for us. While some horses may be starting to slow down at 15, others are still fresh and frisky well into their 20s. 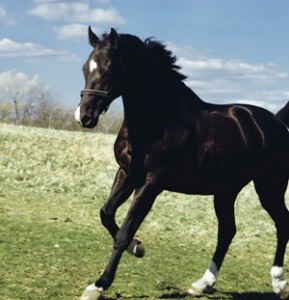 No matter what your horse’s chronological age, if he’s starting to show signs of aging such as stiffness, difficulty maintaining weight or decreased immune response, it’s time to start thinking of him as a senior. It’s important to monitor your senior’s teeth all year-round, but winter is especially critical. If he can’t chew properly, he’s not going to receive the full benefit of the food you’re providing. That means wasted calories and wasted nutrients, and a horse whose diet isn’t meeting his needs. Ground conditions change daily throughout the winter, from warmer and wetter to frozen solid. These fluctuations can wreak havoc on your horse’s hooves, so monitor his feet and work closely with your farrier to keep them in tip-top shape. As with any horse, the basis of your senior’s diet should be high quality forage. Hindgut fermentation of long-stem forage is your horse’s primary heat source in the colder months, so a steady supply of quality hay is critical. 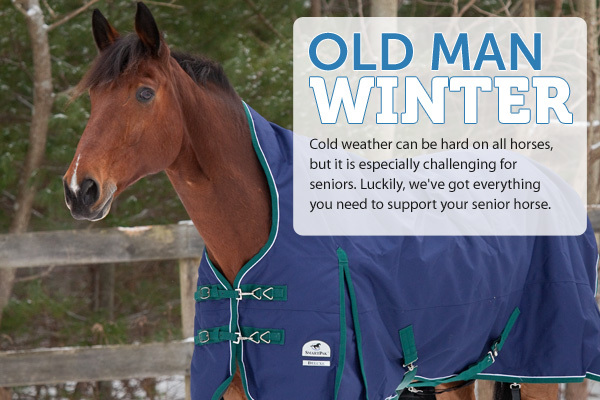 Senior horses’ skin is especially susceptible to infections and other problems caused by harsh winter conditions. Even if you haven’t s blanketed before, you may want to consider providing a waterproof layer to help protect his skin. But skin problems, like rain rot, can still occur under blankets, so it’s important to remove the blankets for regular grooming. Years of travelling, training and competing can really take a toll on joints. Many older horses lose mobility due to stiffness and soreness. But you can help! There are many joint supplements formulated to support the specific needs of the senior horse. Look for ingredients like Glucosamine, Chondroitin Sulfate and HA for joint tissue health, and powerful inflammation-fighters such as MSM, Devil’s Claw and Yucca. For comprehensive joint support combined with potent antioxidants for cellular health and ingredients for digestive support, consider SmartFlex Senior, Senior Flex H/A Pellets or Grand Flex Senior. Many senior horses may drop weight and lose muscle tone over the winter, so it’s important to monitor your horse’s Body Condition Score. To make sure you have an accurate picture of his weight, remove his blanket regularly and work your fingers through his coat to feel for his ribs. If your senior is losing weight, support his body condition with supplements that contain prebiotics, probiotics and enzymes for digestive support, as well as healthy fats and critical amino acids for muscle tone and weight gain. SmartGain 4 combines all these ingredients with Fenugreek, an herb that helps stimulate the appetite. As they age, seniors’ immune function starts to lose efficiency and efficacy. This means your horse may be more prone to illness or slower to heal from injury. SmartProtect Ultra combines potent antioxidants, including Vitamin C and Super Oxide Dismutase, with bioflavonoids, herbs and other ingredients to support the immune system. APF contains a highly concentrated blend of adaptogenic herbs that promote a healthy immune response and may aid in recovery from illness or injury. Many horses decrease their water intake during colder months, due to cold, or even frozen water. But adequate water consumption is key to temperature regulation and is also essential for proper digestion. Make sure your senior has 24/7 access to fresh, lukewarm water. Hang a Heated Flatback Bucket (#12005, $43.95) in your senior’s stall, and consider adding an electrolyte like SmartLytes or Apple-A-Day to encourage him to drink. i agree certainingly she has regular floating. hoofs shots.she just went through a virus simalar to lime diease. she was treated her temprture was 104 for two days she is a survier . My senior horse (age 29) is UTD on vaccines, worming, and teeth floating. He has not maintained his weight for 2-3 years now. It would be helpful if your supplement comparisons would show the amount of calories per serving so we could take that into account when choosing which to give. Hi Lori – Unfortunately, calories per serving is not really the most helpful information for each of the supplements in the weight gain category. While it would work for some—like fat, where the weight gain component truly comes from the calories or energy provided by the supplement—it would not work for all, such as products containing amino acids. Ingredients like lysine, methionine and threonine are added not for the calories they provide because they are the building blocks of protein for muscle mass. Please let us know if you have any additional questions! I own a 27 year old Morgan who has poor teeth so he eats a lot of mush made with triple crown feed and smartgain 4 which has really helped keep the weight on him, i also use smartpak smart protect, i had stopped using it for a few weeks because i didn’t think he needed it and then he got an infection so i put him right back on it and he also gets smartlytes to keep him drinking. My horse looks so good and he is jumping 2 feet and has never looked or acted like he feels so good since i have owned him. thank you smartpak!! My “Golden Oldie” is only 17 but has slowed down due to arthritis in his hocks. After being on Bute for 3 years, he has been on SmartFlex Senior for 7 months now and off Bute totally for 1 month. He is pretty stiff but works out of it and takes aspirin for pain. This will be his first year with a blanket. He gets his teeth done 2x a year and the vet says they are excellent for his age! I have a 28 yr. Old QH gelding with very bad arthiritis in his knees. He has been semi-retired now for over two years because of the stiffness. Before the farrier comes for trims, I have always given B.C. bute to help the discomfort. He has been on numerous supplements, in the past, with little difference in comfort level. One month ago, he began SmartFlex Senior. My farrier commented right away at this visit, what a difference he sees in B.C.’s flexability and comfort. It was then that I told my farrier that B.C. Is on the new supplement. We are also taking trail rides again. It is like we have gone back in time to his younger days!! I have a 30 yr old Thoroughbred/Quarter Horse, has maintained her weight. I’ve been feeding her a flake of grass/alfalfa and a flake of Timothy, and I soak Kountry Buffet. I also been feeding her Garlic Flakes in the summer months and Smart Omega 3. She’s a great horse. She’s UTD on her shots, had her teeth floated. She holds her weight just fine. She still loves to go. Wish there was a way to post her pic. She greats me every time I go outside. She has a bunch of winter hair on, The only time I blanket her is when it drops below zero.